After a hot Saturday night in Paris, I took a car-sharing towards Berlin. 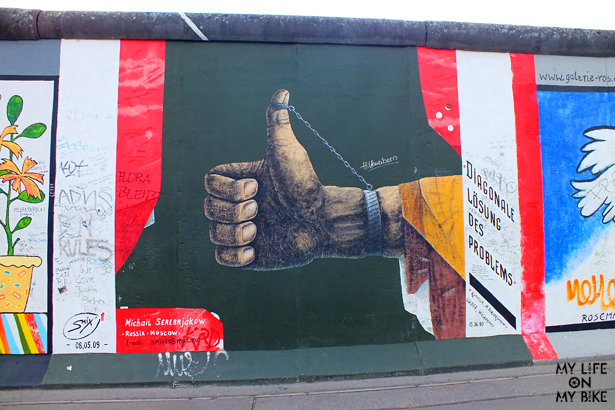 Even with a long, tiresome trip (1000 km) on the road, it was completely worthy to arrive there late on Sunday night and see the East Side Gallery as the first thing, the 1.3 km-long section of Berlin wall, with 105 paintings by artists from all over the world. I was welcomed to Berlin! 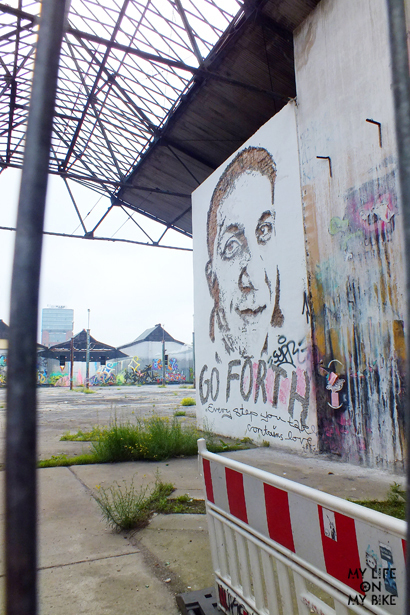 Berlin is not necessarily a super pretty place, more than 80% of the city was destroyed during the Second War and the architecture is variable. 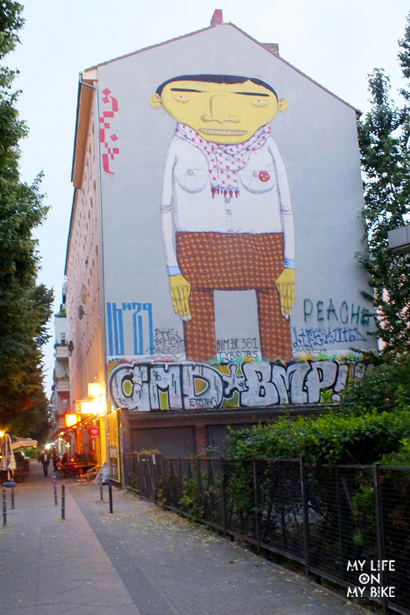 What makes Berlin an incredible place is the multiculturalism, the artistic environment, a young, bike-friendly, open-minded, easygoing energy… the city is affordable, you can easily make friends on the streets, people are stylish, there are tags and street-art everywhere. 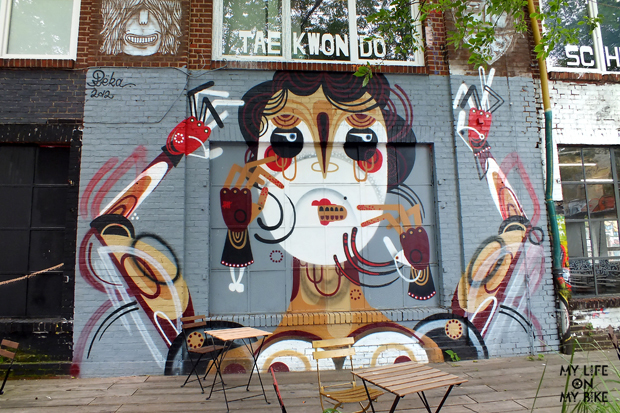 Berlin is vibrant, full of life! The reason I traveled to Berlin was obviously to investigate the street-art scene, but the biggest news is that I also came to see the Fashion Berlin. Some of my readers may know my professional background in Brazil for ten years in the fashion business (if you are interested, you can watch this video clicking here and see what I used to do, but it’s only in Portuguese). But to be honest, at one point I got tired of fashion. When I moved to Canada, at the end of 2010 with the proposal to rediscover my professional path, I could never imagine myself going to fashion shows and fairs again. 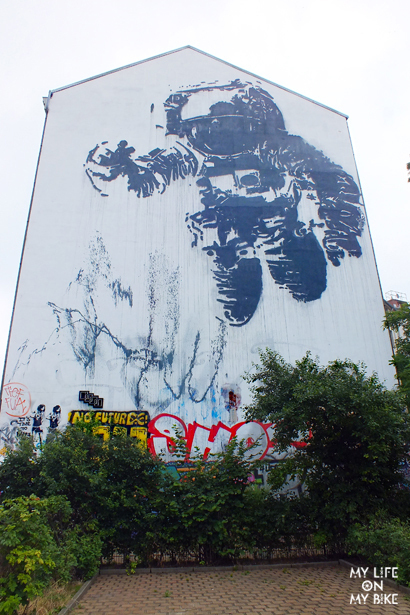 Specially while travelling to a city like Berlin, full of street-art… Ironic? I wouldn’t say so, as fashion has many facets, it is still about creation and relation with art, once fashion influences cinema and photography, for example. In my case, in Brazil it was about influencing people to consume trough marketing strategy, selling products with the best possible markup. Nothing wrong with it, it is about business, after all. But it is hard to realize that sometimes you are contributing with a kind of “dark marketing”, that produces a product in a not really ethical way. Two months ago, I was invited by a couple of German friends, who manages the creative agency Montebelo, to be part of the team. Montebelo is an agency for design and textile production, but with a huge difference. The mean purpose of Montebelo is to be sustainable in all senses, promoting artists and eco street-fashion brands, supporting causes like Surfrider Foundation and sharing knowledge and creativity with all members involved. With this vanguard way of thinking, I could not deny my knowledge about the Brazilian fashion market and I accepted the invitation. After a week experience with the team (as I wrote on my last article) in the south of France, it was time to refresh my mind about how the European fashion market really works. During the first 3 days of the week, I immersed myself in 4 different fairs and one fashion show. We visited the tradeshow Bread and Butter, Bright, Premium and the most interesting one: Ethical Fashion Show. I updated my brain about what the current right design concepts are, trends, packaging, way of production, new materials, style, concepts, collaborations, technological and natural way of production… always with the focus of being completely sustainable. One night we watched the “shau 13”, the fashion show from the very prestigious Berlin University of the Arts, to catch the trends from the newly graduated. After this fancy world, we had dinner at a famous burger place in Berlin, under the bridge, named Burgermeister, that used to be a public restroom. It was tasty and completely alternative! Now, let’s go to the streets and take a look where the inspiration for fashion really comes from? 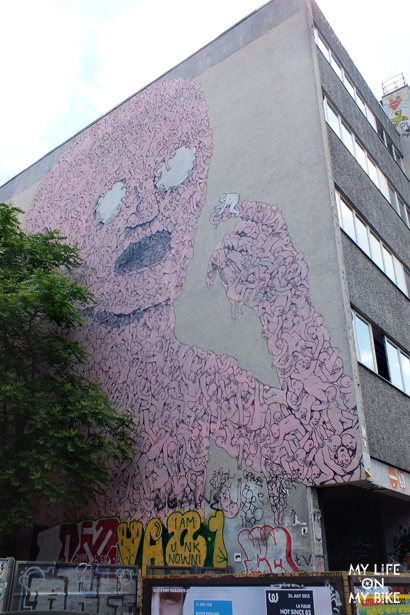 I went on a street-art tour, with the guys from the Alternative Berlin. I was impressed to discover more about the 1UP crew, which has more than 70 people tagging it in the city, including many female members. 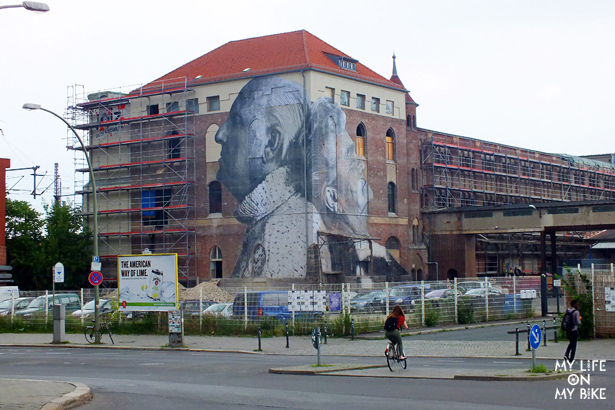 I was lucky to see the super fresh series of the French artist JR and his enormous portraits on the walls, from the worldwide series “Wrinkles of the city”. The big pieces of the artists Blu, Roa, Vhils, Ash ( some from the legendary Backjumps street-art project), were very impressive, but my heart beat stronger when I saw the big wall of the Brazilian artists Os Gêmeos. 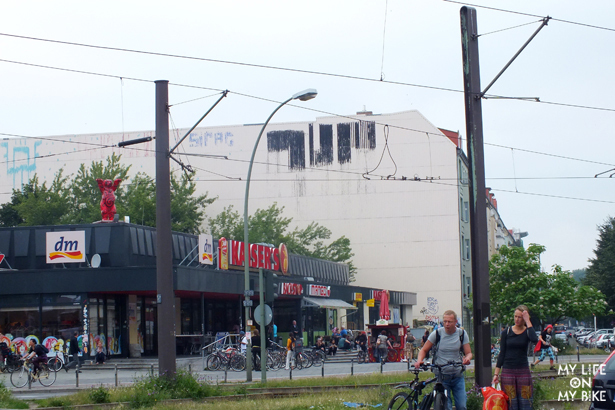 Tags, past-ups, stickers, installations, stencils, bombing were screaming all over Berlin, a sight for my sore eyes! 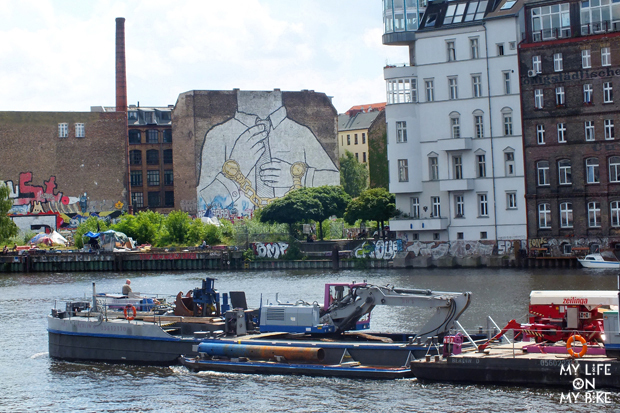 But the highlight of the trip was when I biked all day alone… When I considered it was “the end of my day”, I grabbed a beer and a slice of pizza, I sat in front of the Spree River, close to the famous Oberbaumbrucke bridge, planning to go back home soon. It was around 10pm, when the sunshine was just setting, a boy came to me and asked: “What are you doing here alone?” and he invited me to join his friends. I came. I met amazing people; we drank club-mate with vodka, took pictures at the Photoautomat, and then danced the whole night in an Underground Club. Finally, I came back home, by bike, at 5am. I was joyous, blissing, singing! 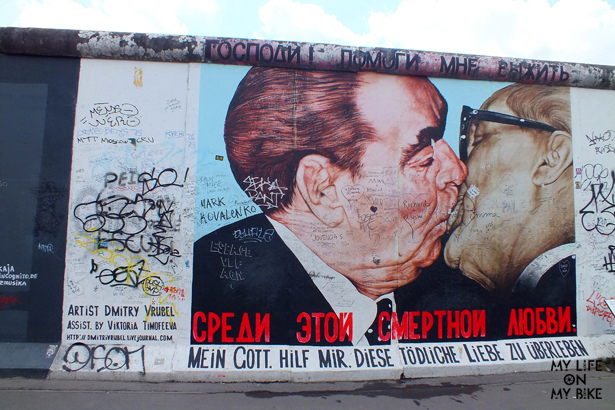 I understood what Berlin is about! And I rediscovered the beauty of fashion!